Already up and running at Tulleys Farm, the “utterly unmissable” Shocktober Fest is set to make you scream for Hallowe’en! The scary theme park, with eight haunting attractions – four of which are new this year, plus live music stages and award winning street theatre, is ideal entertainment for everybody. There’s great rates for group bookings and corporate parties and regular discounts available on their Facebook and Twitter. 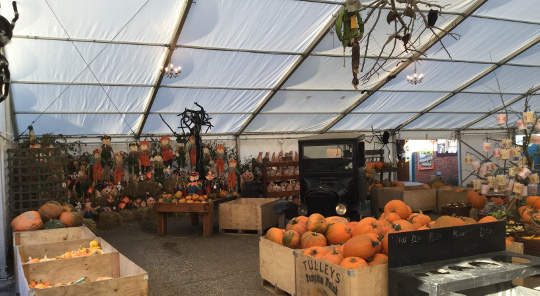 ABC Marquees have once again provided and installed all the required marquees, flooring and staging at Tulleys, in Turners Hill near Crawley, including over 10 marquees – from 3m x 9m up to 15m x 24m – and more than 3000 m2 of tentage in all! The event is well-prepared for October weather, with covered food and seating areas, a warming hog roast and covered walkways and queue lines – so your only discomfort will be the fright of your life!